Toronto based Sysomos, which describes itself as the leading provider of social media monitoring and analytics, powered by patent-pending technology, has released some interesting Twitter research about retweets and replies. Sysomos examined a sample of 1.2 billion tweets to find out how many of them actually entice a reaction. 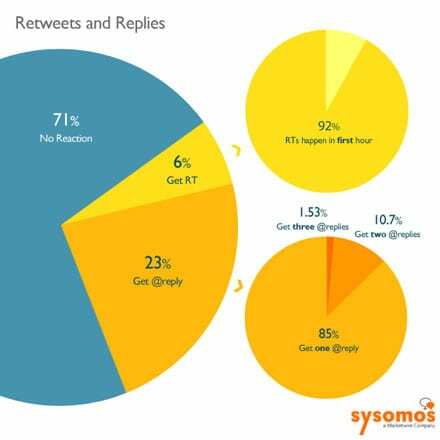 According to the report, 29% of all tweets produce a reaction in the form of a reply or retweet; 6% were retweets and 23% replies. Intuitively, 92.4% of all retweets happen within the first hour after being published. Only 1.63% happen in the second hour. As time goes on, a tweet falls further back in the real time conversation making it somewhat less relevant. Replies are similar, 96.9% happen within the first hour. But what about an original tweet and the number of replies it garners? Of the 23% of tweets that get a first reply, 85% of those only get one reply. 10.7% get a reply to the original reply explained as a conversation 2 levels deep. Only a miniscule 1.53% get a third level response.